On 30Mar05 I witnessed this Bombardier CRJ200ER N661BR (c/n 7520) ligning up for take off from Charlotte IAP,NC. Independence Air announced the new name for Atlantic Coast Airlines on 19Nov03 and was rebranding itself as the new low-fare airline on the US Eastcoast; it continued to be based at Washington-Dulles (IAD). The first CRJ was quickly repainted and 25 Airbus A319/A320 were ordered. 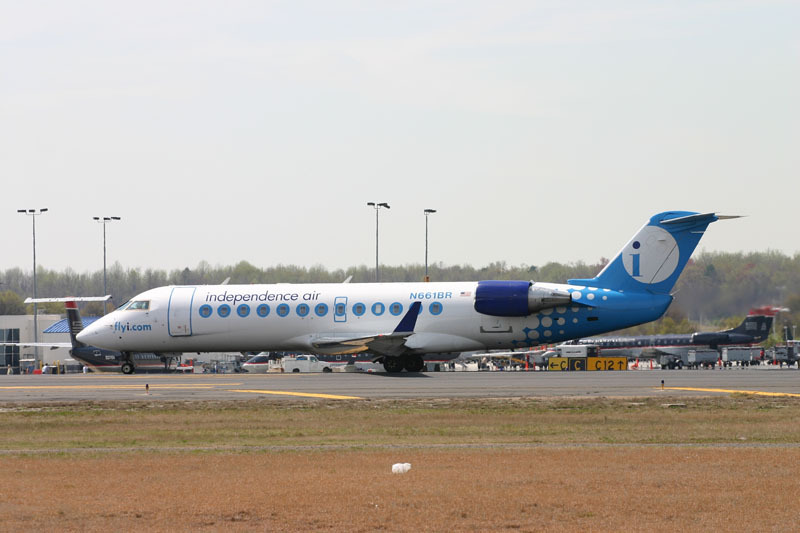 The official launch took place during the first half of 2004; Independence Air actually started in June 2004 with routes from Washington-IAD to Atlanta, Boston, Chicago, Newark and Raleigh; other destinations followed. A complicating factor in this restart was Atlantic Coast Airlines (ACA) release from its contractual obligations to United Airlines, as part of the UAL bankruptcy (Chapter 11) process. In January 2006 it was over, reputedly the first airline in 2006 to go under. Independence Air ("Flyi") operated a large fleet Bombardier CRJs and a selection of Airbus A319s. During March 2006 Northwest Airlines confirmed it had agreed to purchase the operating certificate of Independence Air for $2m to accelerate development of its new S-JET regional subsidiary.